Hyderabad summers are the perfect time to visit the waterfalls around near the city and admire the extravagance of nature's beauty as we try to cool off the scorching heat. Yes, waterfalls, the city has several waterfalls that offer fantastic weekend getaways to people staying close by. A 70-feet high gorgeous beauty, located in the Guntur district in Andhra Pradesh, Ethipothala Waterfalls fall into a lagoon as three streams combine to create this beautiful tourist spot. These streams are called Nakka Vagu, Tummala Vagu and Chandravanka Vagu. The most exciting part about this place is that there is also a crocodile breeding centre here which attracts many travellers every year. While you visit Ethipothala Waterfalls, make sure you also add Ranganatha and Dattatreya temples to your itinerary. It is almost impossible to describe the sheer beauty of these falls into words. Talakona Waterfalls is considered as the gateway to the Tirumala Hills. The gushing stream from a height of 270 ft. makes it the highest waterfall in the state which makes one feel humbled. Located in the Chittoor District in the Sri Venkateswara National Park, the local community claims that the water has a specific medicinal value. A small temple where the devotees worship Lord Siddeshwara Swamy celebrates the Shivratri festival with great enthusiasm. On the Kadam River, the thunder of falling waters of the Pochera Falls has the potential to create an impressive scenic spot. A popular water fall near Hyderabad, it goes through a series of steps to finally create a pool at the height of about 40 feet. The area around the park is well-maintained by the State Tourism Department. During the peak monsoon seasons, it is advisable not to get into the pool as the water flow is intense. You cannot do anything about that feeling of absolute awe which takes over when you see this gorgeous beauty for the first time. Falling at the height of 200 feet, Kuntala Falls are located in the middle of the Sahyadri mountain range. A popular tourist destination in Telangana, Kadam River is the source of these Falls. The ideal time to visit this place is during the monsoon season when the Kuntala Falls has an excellent water flow, and the surroundings are covered in a lush green carpet. One might find small shops selling packaged drinking water and biscuits here. With nature's generosity for the areas nearby Hyderabad, Gayatri Waterfalls which is locally known as Gadidha Gundam or Mukti Gundam is a hidden gem. Located in a faraway spot amidst the dense forest near Tarnam Khurd, this place is a heavenly retreat if someone needs some time off from the urban chaos. These falls cascade down from a height of approximately 100 ft and render a magical charm to the valley below. Tourists can swim in the pool below and have a gala time clicking pictures here. It is ideal to pack a snack and water while visiting this place as there are no eateries in the area. The ride to the Sahastrakund Waterfalls might be bumpy, but it is worth it. Located in the Nanded district in the state of Maharashtra, it is situated on the Penganga River. The fall drops at 50 feet below which gives tourists a stunning vantage point from the base point to view at the crystal-clear water pool below. On both sides of the river, there are two temples which are frequently visited by people who come here. The Watchtower in the area gives you great glimpses of this waterfall near Hyderabad. Visiting the Mallela Theertham Waterfalls during monsoon or post-monsoon months is indeed a mesmerising experience. Located in the Nallamala Forest in Nagarkurnool, Telangana, India, these waterfalls trace their origin to the River Krishna which flows through the forest. There are a total of 380 steps that need to be walked down to reach the ideal spot to catch the water falling as a beautiful stream. A favourite hangout spot for students and people from Hyderabad, this place is believed to be a pious one where numerous priests have meditated as a dedication of prayers to Lord Shiva. Everyone who has visited Tadimada Waterfalls has undoubtedly fallen in love with the majestic beauty of the place. 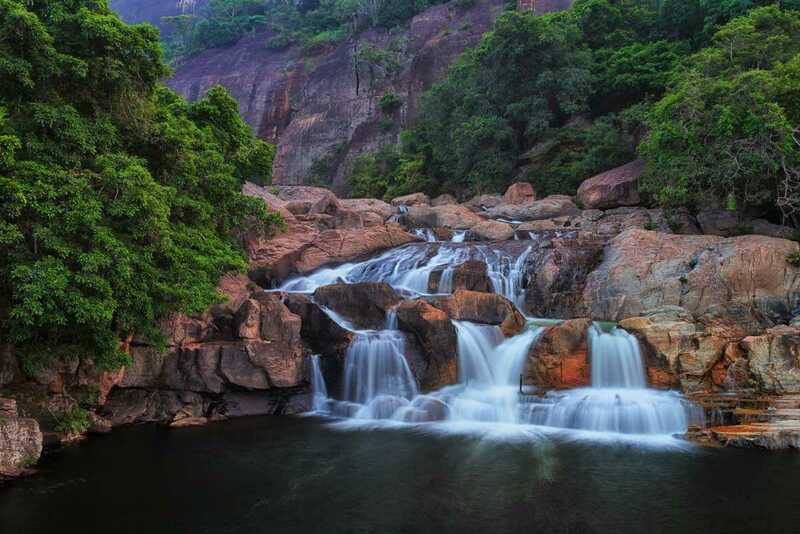 Commonly known as Anantgiri Waterfalls, these are located in the Vizag district. A favourite tourist spot in the Araku Valley, one can explore the area around the Waterfalls trough the trekking trails. Once you reach the place, get a bird's eye view of the valley. One of the favourite spots for tourists to stop by and admire the nature being in one of its most impressive forms. The Borra Caves where these Falls are located, are equally enticing who is visiting this place. The cascading waterfalls and the sparkling water accumulating in the pool are a feast for one's eyes. For campers, this waterfall near Hyderabad is an exciting spot as cooking and camping are allowed here. A bumpy yet adventurous jeep ride to a good spot near the waterfalls where you can settle down to prepare a nice meal and relish it. To see the Bheemuni Paadam Waterfalls at their gushiest and whitest, visit this place during the rainy season. The Waterfalls flow through a rock which appears to be an impression of the legendary hero Bheema's footprint, hence, the name Bheemuni Paadam. As the water cascades through the smooth rocks and falls at a height of 70 feet at the bottom, the pretty sight is the real reward of the journey to this place. A picturesque waterfall in the district of Khammam, the Bogatha waterfall provides an opportunity for the visitor to witness the spectacle of waters cascading into the faces of the cliff, carving out a topography unlike any, thus the epithet, 'Niagara Of Telangana'. As a motorable road is not available, visitors need to trek for some distance thus enabling nature enthusiasts to indulge in the serenity of the greenery around. If you are visiting Hyderabad, then you will never run out of options to enjoy some peaceful time with nature as you plan a visit to these waterfalls. Home to a nearly a dozen stunning waterfalls, the area around Hyderabad has ample options for excellent stop-offs on your driving routes. The scenic attraction along with the trekking trails and picnic or camping areas make this list of Waterfalls as an essential must-visit list for the upcoming monsoon season. Planning a trip with all the necessary information makes life easier and better. Now, all that is left the planning a visit to each one of these tourist spots and create some unforgettable memories. Road Trips From Hyderabad That You Must Drive Along!